MASTER SHENG YEN is the best-known Chan (Chinese Zen) master in America, having taught in the U.S. since 1976. His Dharma Drum Buddhist Association has twenty-one centers throughout North America, as well as dozens of others throughout the world. 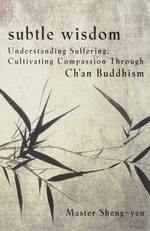 He has co-led retreats with the Dalai Lama and is the author of numerous books. Be the first to find out about Master Sheng Yen.